In his final press conference, former President George W. Bush contended that the most prominent accomplishment of his presidency was making the country "safer." He was, of course, referring to the retaliatory measures taken abroad after the 9/11 attacks and the Homeland Security forces implemented at home. The criticisms for these measures are well known, but the overreaching effects they have had in Arab countries have been examined only on the surface by our media. With a new administration in Washington, we may need not only a changing of the guard, but a nationwide shift in our approach to threats in the Middle East. A study called "The Iraq Effect," published in 2007 by terrorism specialists Peter Bergen and Paul Cruickshank, estimated that the Iraq War "increased terrorism sevenfold worldwide." It's an important, detailed study, calculated by using the Rand Corporation database. Focusing on fatal jihadist attacks, the results show that regions affected by the Iraq invasion have suffered "hundreds of additional terrorist attacks and thousands of civilian lives lost." The authors argue not that terrorism would cease to exist without the U.S. occupation, but rather that our actions have stirred the fire considerably. Mr. Bush argued in 2005 that "if we were not fighting and destroying this enemy in Iraq … they would be plotting and killing Americans across the world and within our own borders. By fighting these terrorists … Americans in uniform are defeating a direct threat to the American people." So has been the jingoistic rhetoric since 9/11, inciting the public to follow the administration's lead. But the evidence to back up these claims has been absent. In fact, it points in the other direction, suggesting that the United States' actions have galvanized a formerly disorganized base of fundamentalist Islamic militants. In spite of the global sympathy generated for America after 9/11, our military aggression has turned that sympathy into something entirely different in some of the most volatile parts of the world. Fawaz Gerges, a professor at Sarah Lawrence College who has done extensive studies on jihadi, found that its leadership sharply condemned Osama bin Laden after the 9/11 attacks, wanting to disassociate themselves from him. Al Qaeda, before the attacks, was nothing more than a network of independent jihadi groups loosely associated by general ideals. After 9/11, the network dissipated, with allegiance retreating from bin Laden, its central figure. However, through aggression in Afghanistan and Iraq, Bush managed to reforge the network's unification, and reignite the extremist base. Watching CNN coverage of the American occupation of Baghdad, an Afghani man named Bashir said, "I'm a moderate Muslim, an educated man. But watching this, even I could become a jihadi. How can Americans say they are making themselves safer? … Your President Bush has done a wonderful job of uniting one billion Muslims against America for the next two hundred years." Michael Scheuer, who tracked Osama bin Laden as a top CIA official, went so far as to describe Bush as bin Laden's "only indispensable ally." If one traces Al Qaeda back further, the network was essentially unknown before 1988. British analyst Jason Burke pointed out that bin Laden was an insignificant figure until then-President Clinton bombed Afghanistan and Sudan. Those strikes led to a steep increase in recruitment and support for extremist networks like Al Qaeda, and also sparked a relationship between bin Laden and the Taliban. So, this effect in the Middle East didn't start with Bush. Noam Chomsky, professor of linguistics at MIT, argued that the United States is not interested in fighting terror as much as it is interested in obedience. "Among Iraqi Arabs," Chomsky said, "by a measure of twelve to one they regard the United States and Britain as an occupying force and not a liberating force … which is unprecedented. The Germans didn't have that much opposition in occupied Europe." Chomsky compared the American pursuit of hegemony to that of a mafia don, wherein violence becomes a necessary instrument of control. If our government was more interested in reducing terror, it might consider more carefully how terrorism constituencies mobilize in the first place. When we invaded Iraq, New York Times columnist Thomas Friedman wrote that: "… we are not doing nation-building in Iraq. We are doing nation creating." Naomi Klein, who examined the United States' economic reasons for violence and exploitation in her book "The Shock Doctrine," responded to Friedman's comment. "Iraq was not an empty space on a map," Klein wrote. "It was and remains a culture as old as civilization, with fierce anti-imperialist pride, strong Arab nationalism, deeply held faiths. … If 'nation creating' was going to happen in Iraq, what exactly was supposed to become of the nation that was already there?" The Shock and Awe invasion did not simply remove a dictator from power, it paralyzed and dismantled a country. Klein pointed out that the goal of Shock and Awe is to render the adversary completely impotent. "When the war began, the residents of Baghdad were subjected to sensory deprivation on a mass scale. One by one, the city's sensory inputs were cut off," starting with the ministry of communication being bombed and set ablaze, along with four Baghdad telephone exchanges, cutting off millions of phones across the city. Then the power went out, plunging the city into darkness as the bombs fell. "In 2003, more than three hundred and eighty [Tomahawk missiles] were launched in a single day. Between March 20 and May 2, the weeks of 'major combat,' the U.S. military dropped more than thirty thousand bombs on Iraq, as well as twenty thousand precision guided cruise missiles — 67 percent of the total number ever made." Then, American soldiers did nothing as looters pillaged priceless antiquities from the National Museum of Iraq. "Terrorists don't try to win through direct confrontation," Klein wrote. "They attempt to break public morale with spectacular, televisual displays that at once display their enemy's vulnerability and their own capacity for cruelty." In this case, Klein was making the unthinkable claim that we, in fact, were the terrorists. Chomsky echoed this taboo by stating, "The term terror is restricted to the sub-category of terror that they carry out against us. Excluded is the usually far greater terror that we carry out against them." After the initial invasion, our government moved on to breaking up the country's infrastructure. Paul Bremer, Bush's appointed occupation authority in Iraq, opened the borders to unrestricted imports and began laying off state employees. Roughly a half million workers — mostly soldiers, but also doctors, teachers, and engineers — had their jobs taken. As Klein reported, "Many of the 400,000 soldiers Bremer laid off went straight to the emerging resistance." An infuriated Iraqi business elite, with what little capital they had left, retaliated by helping fund the resistance. The American press was comfortable blaming Iraqis for the eruption of sectarian violence that followed, but to separate the escalation of violence from the terrorizing occupation is irresponsible. The problem is not simply miscalculation in Iraq, or mismanagement, it is the effect that our bellicose approach to intervention has on the perception of foreign countries. In Bush's words we are liberators, but in the eyes of many Iraqis, Afghanis, Pakistanis, Saudis, Lebanese and Palestinians, we are a terrifying force. As Chomsky argued, many of these people are "starting to equate the U.S.'s suffocating desire to bring them 'freedom' with the kiss of death." In a section of the world where many of the governments fail their own people and fundamentalist schools provide the only means of education for a large portion of children, we feed dangerously into the hands of an extremist agenda. The Middle East faces a staggering challenge in moving away from fundamentalism toward modernization as it is, even without us exacerbating the problem. Take Pakistan, for example. 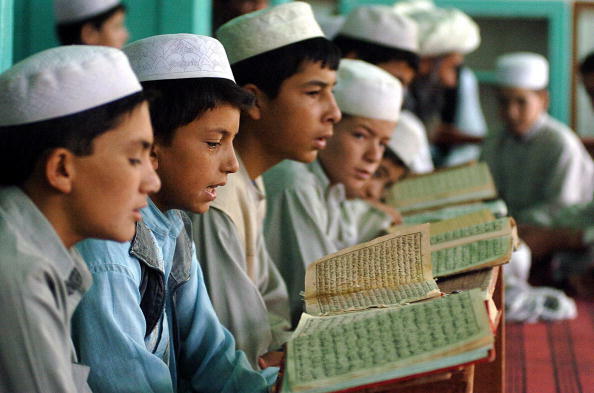 A World Bank study estimated that by 2001 at least 20,000 madrassas were teaching as many as two million Pakistani students an Islamic-based curriculum. Not every madrassa is a hotbed of extremism, but the study concluded that 15 to 20 percent of the students were receiving military training within a curriculum that emphasized jihad and hatred of the West, at the expense of math, science, and literature. Ahmed Rashid, a journalist who has studied the link between madrassa education and the rise of extremism, estimated that 80,000 of these students became Taliban recruits. And this was before the post-9/11 attacks on Afghanistan and Iraq. The results of this World Bank study can be explained primarily in economic terms, seeing that madrassas offer some impoverished families the only option available when it comes to education. But when you factor in American aggression, support for Islamic institutions skyrockets. Shifting back to Iraq, an Oxford research poll found that, in a period of six months in 2004, the amount of Iraqis who wanted an 'Islamic state' as their system of government spiked from 21 percent to 70 percent. If we are ever to quell anti-American sentiment in the Middle East, we must examine more closely how such sentiment takes root, and how our instigation waters those roots. In a region that is rife with turmoil, poverty, and fundamentalism, the pot is already boiling. By acting unilaterally in our policing, we send an infuriating message to these people and the rest of the world. When unilateralism goes unchecked, it also sends a subliminal message to our own people. Howard Friel and Richard Falk, specialists on international law, noted that in the seventy editorials on Iraq published in The New York Times between 9/11 and the invasion of Iraq, the words "UN Charter" and "international law" never appeared. Instead we heard talk of Bush's messianic mission and of good prevailing over evil, which interestingly is the same kind of language bin Laden is known to use. Although police work is sometimes necessary to combat terrorist cells, our recipe to fight violence with violence has perpetuated and deepened cultural divides. One man, Greg Mortenson, has chosen an alternative to this pattern. Mortenson, an ex-mountain climber, began building schools in remote regions of Pakistan in the 1990's and later expanded his mission into Afghanistan. Mortenson's story is told in the book "Three Cups of Tea," and his organization, the Central Asia Institute, has built dozens of schools for people whose lives have been torn by war, threatened by extremism, and cut off from the world of education. "If we try to resolve terrorism with military might and nothing else," Mortenson said, "we will be no safer than we were before 9/11. If we truly want a legacy of peace for our children, we need to understand that this is a war that will ultimately be won with books, not with bombs." Mortenson has had to overcome some perilous situations throughout his mission, but the victories have had ripples. With each brick his institute lays, a piece of America's tarnished image is corrected. When he visits these regions, he actually is greeted as a liberator. Although Mortenson's example is a microcosm of the greater problem, it demonstrates an important principle. Bashir, the Afghani man watching CNN's coverage of Baghdad, said to Mortenson, "You have to attack the source of your enemy's strength. In America's case, that's not Osama or Saddam or anyone else. The enemy is ignorance. The only way to defeat it is to build relationships with these people, to draw them into the modern world with education and business. Otherwise the fight will go on forever." Turning those words into policy will require a long, complicated effort, but the principle represents the "sea change" needed in our country. Only with initiatives that are underlain by peaceful and cooperative measures can we expect to make long-term progress. With President Obama now in office, the new administration has more to fix than foreign policy, but the subject is an integral one to our nation's longevity, as well as to the fate of the Middle East. In his inaugural address, Mr. Obama insisted that "our power alone cannot protect us, nor does it entitle us to do as we please. Instead … our power grows through its prudent use." A few days later, we dropped bombs on Pakistan. If those bombs did in fact take out terrorist cells, the question is what we plan to do in these areas when the smoke clears. In an interview with the Dubai-based Al Arabiya cable network, a news channel broadcast in Arabic, the president offered a new tone to this arena. "The Americans are not your enemy," he told Muslim listeners. "We can have legitimate disagreements but still be respectful. I cannot respect terrorist organizations … and we will hunt them down. But to the broader Muslim world what we are going to be offering is a hand of friendship." He went on to say that his "job is to communicate to the American people that the Muslim world is filled with extraordinary people who simply want to live their lives and see their children live better lives." When his special envoy to the Middle East, George J. Mitchell, began his eight-day tour of Europe and the Middle East, Obama told him to "start by listening, because all too often the United States starts by dictating." If we can back the president in this conciliatory tone, perhaps we can start to build back some of what has been destroyed. We have power in this country like nowhere else, and now is a chance to demonstrate the difference between it and brutality. Joshua Pringle is a journalist whose work has been published in Queen City Forum Magazine, Southeast Ohio Magazine, and other news publications.